Since I will be spending time with family tomorrow and Friday, I will take a break from blogging on those two days, returning some time on the weekend. Since I'll be away, I decided to do my normal weekly roundup early. Mark my words. And when this becomes apparent, Republican resistance to it is going to soften. Yesterday, I posted again on Rangel's proposal to reinstitute the military draft because I saw yet another weak objection to it at a prominent conservative blog. In addition to noting the weaknesses of that argument, I anticipated how the national debate over the proposal might progress since Rangel has admitted that he is not thinking exclusively along the lines of military service when he says he wants to make everyone serve the state for two years. Given that Colin Powell and John McCain -- to name just two prominent Republicans -- both favor national service, how likely will other Republicans be to take a stand against Rangel's "draft"? If volunteering for the military can substitute for it? If the military gets to cherry-pick from the draftees? If some of the draftees get to serve in "faith-based" initiatives? The more I think about this, the more worried get that unless more and better arguments are made against this horrendous idea on moral grounds, the more likely we Americans are to get blindsided by a bunch of politicians pulling the bait-and-switch of a national service measure Republicans foolishly support in the initial guise of an anti-war draft proposal by a Democrat. Andy over at Cozy Corner gives this a go. He rightly notes that, "[T]he draft is a form of institutionalized slavery," but he undercuts himself by conceding that the draft is morally defensible "for the survival of a nation". The flaw in this argument is that it forgets what the proper purpose of a government is: the defense of individual rights, the most fundamental of which is the right to one's own life. If a nation does not do just that, it does not deserve to survive. When one of America's Founding Fathers said, "A republic, if you can keep it," he very succinctly stated how crucial it is for the people to take self-government seriously. Andy (like very many others) sees clearly that a nation cannot defend itself without an army. But what good is such a "defense" if said country denies the rights of its own citizens to decide for themselves whether to risk combat? We must not only be willing to serve in the military or at least offer strong support to those who do (or find another means of self-defense, like hiring mercenaries) in order to remain free, we must consistently adhere to the principle that servitude is wrong. Once we make even one exception, we open the door to countless others. The government is only our servant. It cannot make us as individuals do what it takes to remain free whether that is to bear arms or to uphold the principle of individual rights. Those jobs lie with the master, us. Government force cannot replace a people's desire to be free or their responsibility to think and act accordingly. Myrhaf gives us a timely update on efforts by the Democrats -- and we all knew they were coming -- to impose government control over alternative media. Such an innocuous name: net neutrality. Who could be against that? And the Internet Nondiscrimination Act of 2006 sounds so fair! What bigot would dare oppose nondiscrimination? Under the cover of these happy fuzzy words the Democrats are about to slap price controls on internet providers. Americans should be happy, as the consumers in the Soviet Union were under price controls. Oh, wait -- there were long lines and empty shelves? Scratch that. But making the internet better is not really the point of all this legislation. Giving the state power over the internet is the point. There have been rumbles about this for quite some time, too. Although Rangel's "draft" threatens to impose two years of slavery on every American, the threat of censorship is by far the greatest danger we face, for only the free exchange of ideas permits rational debate about politics to occur, and only reason permits us any hope of examining and correcting past mistakes. Keeping our freedom of speech is Job One for the foreseeable future in the current political climate. On the Freedom of Speech front: the California Supreme Court recently made a ruling that is clearly applicable to bloggers. "Websites that publish inflammatory information written by other parties cannot be sued for libel, the California Supreme Court ruled Monday." Oh yeah. I nearly forgot, there's a war going on. Bubblehead posts an update on the recent collision of a Japanese submarine with a tanker, complete with a photo of the damage. Money quote: "Note for non-submariners: The rudder is supposed to be vertical." So the United States is "the most unfriendly country to visitors". Rude immigration officials and visa delays keep millions of foreign visitors away from the United States, hurt the country's already battered image, and cost the U.S. billions of dollars in lost revenue, according to an advocacy group formed to push for a better system. To drive home the point, the Discover America Partnership released the result of a global survey on Monday which showed that international travelers see the United States as the world's worst country in terms of getting a visa and, once you have it, making your way past rude immigration officials. Gosh. I wonder why. Before I get to my point, though, there is the following not unrelated story. Six imams have the audacity to act indignant when they arouse suspicion aboard a plane flight and are escorted off in handcuffs, which is standard for passengers who do not obey orders from the flight crew. A passenger initially raised concerns about the group through a note passed to a flight attendant, according to Andrea Rader, a spokeswoman for US Airways. She said police were called after the captain and airport security workers asked the men to leave the plane and the men refused. "CAIR will be filing a complaint with relevant authorities in the morning over the treatment of the imams to determine whether the incident was caused by anti-Muslim hysteria by the passengers and/or the airline crew," Hooper said. "Because, unfortunately, this is a growing problem of singling out Muslims or people perceived to be Muslims at airports, and it's one that we've been addressing for some time." But even if our government actually protected the right of a carrier like Jet Blue to bar certain forms of dress on its flights, all the above still does not mean that the government would properly just ignore suspicious-looking characters with an interest in domestic aviation. 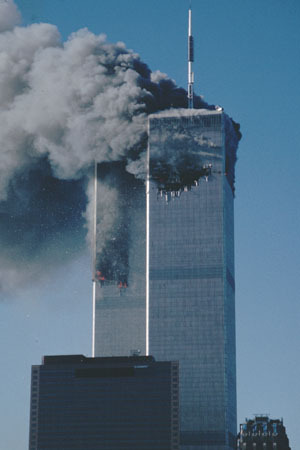 Not after the atrocities committed in the name of Islam on September 11, 2001. So these imams were allegedly praying. Let them pray, but do not force an airline to ignore the fact that they are Moslem or pretend that their religion does not rightfully arouse suspicions among most Americans. If they haven't the foresight to schedule a flight around prayer time in an overwhelmingly non-Moslem country which has been repeatedly attacked by Moslems, then tough nuts. Have these nincompoops never heard of red-eye flights? Or trains? Or automobiles? I thank US Airways for being attentive to the concerns of its passengers and fully support its right -- which our government does not adequately defend and may infringe further -- to refuse service to anyone for any reason it pleases. Perhaps if our government would fight a ruthless war abroad and respect property rights at home -- rather than indiscriminately hassling all foreign visitors -- we would not have our ill-deserved new reputation. Software Nerd asks an interesting question: Why aren't there more business novels? Robert Tracy introduces and provides a link to the site of a talented, self-taught photographer, Chris Kamphaus. There is a short, but interesting article at MSNBC about fault lines in the Democratic Party. But the tectonic plates move in dangerous ways when the topics are taxes, trade, torts and terrorism. [George] Miller voted against reducing the federal tax code's "marriage penalty"; [Ellen] Tauscher was for it. He was against liberalizing trade with China; she was for it. He was against limiting awards in lawsuits; she was for it. 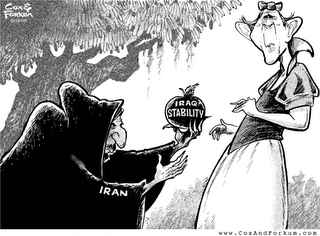 Then there is terrorism -- and Iraq. Tauscher, with her lower Manhattan ties and her swing district (which includes two of the government's most important defense-research labs), voted to authorize the war in Iraq and is wary of the consequences of a too-hasty exit. To Miller, the war is an unsalvageable blunder. Coming of age in antiwar San Francisco, his view is framed by Vietnam. He voted against authorizing the invasion. He admires Rep. John Murtha of Pennsylvania for having come forward last year to denounce it. "Everyone discounted the criticisms of people like me because we were the 'antiwar crowd'," Miller says. "Jack gave the Democratic Party a place to stand." Tauscher is a mixed bag to be sure, but if there are more people like her in the party (and this article is accurate), that would be a very good thing. ... with Oak Tree? I can still access individual entries from my feed, but the main page of the blog is FUBAR. Nick Provenzo reports on an unwarranted use of our military: spreading religion. The Beverly Hills Teddy Bear Co. manufactures a Jesus doll that is less a toy and more a tool with which to preach Christianity to children. For example, the toy quotes the Holy Bible with statements like "I tell you the truth, no one can see the kingdom of God unless he is born again." The doll's manufacturer offered to donate 4,000 of its dolls to the Marine Toys for Tots Foundation, founded by the Marines in 1947 to ensure that needy children received some toys for Christmas. The foundation, supported today by the Marine Corps Reserves as part of its official mission, opted to refuse the Jesus dolls on the grounds that the Marines don't profess one faith over another, and that the doll was an inappropriate gift for a non-Christian family. And that's when all hell broke lose. In response to its decision, the foundation was peppered with so many calls of Christian outrage that The Washington Post reports that it became impossible for the foundation to perform its mission -- which is simply to give some hard-luck kids something nice to play with on Christmas Day. Caving in to the pressure, the foundation reversed itself and agreed to accept the Jesus dolls, and will simply have to make an extra effort in addition to its already large commitments to ensure that these dolls don't go to families that don't want them. The purpose of our military is to defend the United States from foreign threats. Not to serve as an overseas welfare agency (to which many conservatives rightfully object) or as a religious order. This is an outrage. As an atheist, I have noticed that religion often coopts many legitimate tasks of cultural transmission, like education, sponsorship of art, and various cultural ceremonies. A corollary of this is that many times, those of us who do not follow a religion find ourselves lacking a viable alternative to a common, at least partially worthwhile cultural practice that has been traditionally prescribed by religion. In that vein, Craig Biddle notices that the positive role of the Christian custom of saying grace at Thanksgiving -- in reminding us of how fortunate we are -- is compromised by the fact that it fails to do justice to those who make our prosperity possible. To say grace is to give credit where none is due -- and, worse, it is to withhold credit where it is due. To say grace is to commit an act of injustice. Rational, productive people -- whether philosophers, scientists, inventors, artists, businessmen, military strategists, friends, family, or yourself -- are who deserve to be thanked for the goods on which your life, liberty, and happiness depend. This holiday season -- and from here out -- don't say grace; say justice: Thank or acknowledge the people who actually provide the goods. Some of them may be sitting right there at the table with you. And if you find yourself at a table where people insist on saying grace, politely insist on saying justice when they're through. It's the right thing to do. Thank you, Craig, and Happy Thanksgiving! [Editor's note: I am glad to know that the paparazzi photographers are not hunting me down.] Read Terry Ng's post, Are You an A-List Bloglebrity? I am okay with being a "c-list blogger"... For a background, read Matt Craven's post, The State of the Blogosphere. Posts that contain Bloglebrity per day for the last 30 days. A plate of humble pie awaits me. I typically start my weekly roundups with whatever happens to be on my mind at the moment. Today, it is the election, thanks to last night's post. I'll get this out of the way right now. I was wrong to side with Robert Tracinski's idea of routing the left in this past election. Although I modulated my position over time, I did not make a major effort to say so here. Furthermore, my position has changed even since Election Day as I have reviewed the positions of various other Objectivists, most notably C. Bradley Thompson, Paul and Diana Hsieh, and John Lewis. It isn't that I am any happier that the Democrats are now in a good position to ram their foolish agenda down our throats. It is that I have reached considered agreement with them that the Republican Party really has gone way downhill. Even many of the "small government" conservatives are just calling themselves that these days. The GOP and the Democrats are now both pushing for the same goals in most cases, but at different speeds. If that is the way it is going to be, then let's at least have the people who are more easily seen as idiots pushing the foolishness. By analogy: If you were unscrupulous and wanted to sell one of your dogs, both cowards, would you feel more likely to get away with selling the one that barks a lot or the one that whimpers? On their prosecution of the war, opposition to environmentalism, and opposition to the welfare state, the Republicans have been barking a lot and the Democrats whimpering. It would be the GOP that would have the easiest time selling such idiocy as continued racial quotas and new carbon taxes because most Americans would not question their motives. 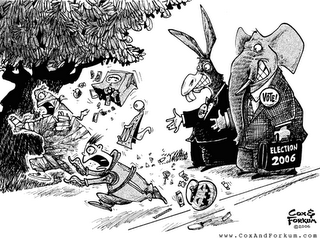 At least with the Democrats in charge of Congress now, everything they do will be inspected with a fine-toothed comb. Communist officials give monotonous speeches warning the populace against "peaceful evolution" toward Western values and decadence. But many, including the revered Gen. Vo Nguyen Giap, under whose command the Vietnamese defeated the French and then the Americans, send their children to study and live in the U.S. and Europe. (Many stay and launder their parents' ill-gotten gains in Western real estate.) The version of Vietnam the Vietnamese people like best is by far the one with America and its stuff. "Facts on the ground" is an argument that sometimes has merit, but as it is being used here, it is simply another variant of the "chickenhawk" fallacy. One need not actually go to Syria to know whether or not it is a state sponsor of terrorism. Nor does visiting the country transform someone into an expert. In fact, given that it is a dictatorship, such a visit will almost certainly make one less knowledgeable. Call me crazy, but a "think tank that promotes thinking" that has already taken the wrong side in the global warming debate has already defeated its stated purpose. Diana Hsieh pointed out a fascinating interview with Judith Martin (aka Miss Manners), who has long been one of my favorite cultural commentators. If you haven't done so already, read it. In addition, a commenter alerted me to a post from awhile back over there that quotes Frederick Douglass on slavery. That, too, is worth a look. And that reminds me.... I still haven't read Andrew Bernstein's The Capitalist Manifesto! So much good reading. So little time. Eric Ryle of The Sub Report offers some in-depth commentary (via Ultraquiet No More) on the recent incident involving the "stalking" of the USS Kitty Hawk by a Chinese submarine. He also discusses the Chinese military and espionage threats in general. In addition, Michell Malkin has updated her post on the subject with more input from submariners. What really matters is what our forces are ordered -- and permitted -- to do. With political correctness permeating our government and even the upper echelons of the military, we never tried the one technique that has a solid track record of defeating insurgents if applied consistently: the rigorous imposition of public order. I think this has even been used in the past against Islamic insurgents by the American military itself! ..."When I got out of the plane in Greensboro in the US state of North Carolina, I would never have expected my host family to welcome me at the airport, wielding a Bible, and saying, 'Child, our Lord sent you half-way around the world to bring you to us.' At that moment I just wanted to turn round and run back to the plane. GB links to the whole story at his blog. Captain Ed says that the GOP seems so far to have learned nothing from its recent shellacking. "[The House and Senate] leadership elections show that Republicans have not listened to their constituents." I would have to agree with that assessment as well as with much of what he says about John McCain, the presumable front-runner for its presidential nomination. very interesting links about Tom Bombadil, that most enigmatic character from J.R.R. Tolkien's Lord of the Rings. To describe either link would be to spoil it, so I shall simply ask, somewhat in the manner of Linda Richman, "Tom Bombadil is either the reader or the Witch-King of Angmar. Discuss." EGO blog has joined ReviewMe publisher network. It will be interesting to see how my readers will react to the sponsored reviews. Posts that contain Reviewme per day for the last 30 days. It is two days after an election which saw the Republicans lose their "permanent majority" rather decisively. Why did this happen? I have argued that the party earned its defeat by attempting to implement a religious agenda domestically while the public was "preoccupied" with the threat of Islamofascist terrorism. At the same time, I never became comfortable enough with the idea, advocated by most prominent Objectivists, of voting for the Democrats to actually do so. Either they were wrong on this point or I have more thinking to do on the subject. Be that as it may, two days is short enough that it is still worth looking at some of the pre-election debate and long enough that some of the fallout from Election Day is becoming apparent. I missed this Allen Forkum blog on the election until this morning. Will Bush adopt even a few of these measure? Perhaps, but the prospects are worse than dim. Certainly the leftist-influenced Democrats will not. I'm hoping that it's still possible to influence Republicans and other Americans to begin fighting to win. However, voting for Democrats in order to hasten a change for better political alternatives could be the better strategy. I'm not yet convinced we've reached that point. This is pretty close to where I was in my explicit thinking Tuesday. My gut feel was indifference to the results. My first stab at making sense of this conflict is that we were fast approaching the point at which the Republicans needed to be dislodged if we weren't there already. This is something I will be sorting out perhaps for some time. A huge misgiving I have about the left is the increasing willingness it has shown in the past decade to forcibly restrict freedom of speech. For example, Michelle Malkin reports that David Horowitz was attacked just yesterday at Ball State, on his way to a speaking engagement. Another misgiving I had about voting for Democrats was that their victory would cause the Republicans to "get the wrong message" and end up becoming more like the Democrats rather than understanding that it was their failure to live up to their own promises that got them into trouble. You doubtless already have heard that Bush has already gotten rid of Donald Rumsfeld in favor of Robert Gates, who believes we can negotiate with Iran. On top of that, Bush seems to have already conceded that there should be a minimum wage hike. What will be interesting to see is how far gone the Republican Party really is. How many more of them need spine transplants, are essentially Dhimmocrats already, or are hell-bent on theocracy? The only substantive political debate going on in America is on the right. Do the better parts of the right really have a home? If so, will they evict their deadbeat roommates? This is what we'll learn. Myrhaf delivers the quote of the day after he observes Arlen Specter winning reelection only to all but switch parties: "With politicians like Specter, the question is not, 'Is America on a highway to hell?' The question is, 'How have we survived this long?'" I feel liberated, and I'm going to tell you as plainly as I can why. I no longer am going to have to carry the water for people who I don't think deserve having their water carried. You know what, Rush? It would have been better for America (and for your self-esteem) if you had not carried the Republicans' water when they did not deserve it. But instead of doing what was best for America, you did what was best for Republican Party power. There is a difference. My initial reaction to hearing about this was about the same. As a scientist, I have a saying that bubbles up to mind when I hear someone defending a view I think is rubbish: "Real scientists don't have pet theories." In the realm of politics, it would go something like this: "Real patriots don't 'carry water'." Trey Givens reacts to the predictably mealy-mouthed assessments of our election results we're getting from abroad. First of all, when anyone tells me what a virtue humility is, I have a nearly irrestistable urge to punch them in the face. My immediate thought is, "How dare you talk to me about humility?" Not because I'm so humble, I'm not, but because I don't see any reason to be more humble than I am. Second of all, Americans have no business voting for the benefit of everyone else in the world. Whatever decisions are made in elections need to be on the grounds that it is what is best for America, so the world's opinion of our leaders be damned. If Allen Forkum is where I was before the election, Trey Givens is, at least in this respect, where I am now. I just got a phone call -- despite being on the national "do not call" list -- with a recorded message informing me that "This call is impor--". God, I hate telephones sometimes. Paul Hsieh writes a very good piece on why it is so crucial to root out attempts to transform America into a theocracy. Although this may seem improbable now, those ideas may seem much more plausible to a country that has been softened up by a barrage of conservative Christian academics and intellectuals who have been teaching that America is a Christian country, that American virtue depends on its religiosity, that the very survival of America depends on the inclusion of religious values in the government, that the "wall of separation" between church and state imposed by the secular Left has been a major source of our problems, and that the attacks we have suffered are the price we are paying for ignoring these "truths". This misintegrated worldview could gain significant traction amongst a large segment of Americans who aren't otherwise armed with a opposing strong rational explicit philosophy. Read it all. There are some especially alarming examples of bleeding edge -- This phrase seems particularly appropriate here! -- conservative thought on the matter of separating church and state at the beginning of the piece. A Bush vs Jesus gag campaign ad has been making the rounds lately. Andrew Dalton says correctly, "Right attack, right target, wrong message." File this away for future investigation: Martin Lindeskog has found a "guest blogging network" that purports to give feedback on which posts attract the most readers. I am unsure of the utility of this for my particular niche, but it is still an interesting idea. Grant Jones lays down the law on comments. I'm with him there, although I have another category of comments I will not post: The confusing. It doesn't happen that often, but once in a while, I will get a comment that just doesn't make any sense to me. I moderate comments, so those just don't get posted. Hey! At least he didn't say, "I could just get drunk one night and start deleting comments at random." Bo has found more submariner types who blog and wonders the same thing I do: Whatever happened to Periscope Jack? That guy was, I am prety sure, the only one I found before Bo or Bubblehead! And it was a very well-done blog, too. Myron asks, "How many of 'you' are there?" There are 49 of "him" in America. I have a rare first name and a common last name. There are 623 of "me" computed in that way. If I use my middle name (as I do on a daily basis, being named for my father), there are 1,564 of me. But there is only one Gus Van Horn! postreach is a guest blogging network. It helps me reach 50% more of my target audience. postreach also helps me discover which posts make my blog great. Posts that contain POSTREACH per day for the last 30 days. Ted Haggard of the New Life Church is not a gay guy at the moment... Could you tell me why Colorado is the religious center for evangelical Christians? UPDATE: Read Nicholas Provenzo's post, The Scientist and the Preacher: Disintegration v. Misintegration. Register at the Ayn Rand Institute and listen to Dr. Leonard Peikoff's lecture series, The DIM Hypothesis (Disintegration - Integration - Misintegration). 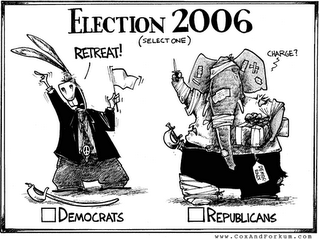 Related: My post, GOP PREMORTEM and Burgess Laughlin's column, VOTER'S DILEMMA? Recommended reading: Ominous Parallels by Dr. Leonard Peikoff. Yes. Even I have my limits! Add numerous extra obligations to a massive dose of election fatigue and you get a somewhat abbreviated weekly roundup! I very nearly decided not to post it at all this morning, but realized that what I have found might, put together, bring some welcome relief from the upcoming election. There is nothing here about the election or John "effin'" Kerry past this point. The Undercurrent has posted a preview (in the form of a few articles) of its upcoming November issue. Through the Harry Binswanger List, I was reminded of an article I'd run across a few days ago about the popular myth -- now being used to sell the idea of government favors for American ethanol producers -- that Brazil's independence from foreign oil is due to its cultivation of a domestic fuel ethanol industry. Brazilian President Luiz Inacio "Lula" da Silva didn't celebrate the oil independence milestone out in an Amazon sugar field. No, he smashed a champagne bottle on the spaceship-like deck of Brazil's vast P-50 oil rig in the Albacora Leste field in the deep blue Atlantic. Why? Brazil's oil independence had virtually nothing to do with its ethanol development. It came from drilling oil. I recall that after the fall of communism, ecological disasters -- real ones -- were turning up all over the old Soviet Bloc for awhile. And then Kyoto, I believe, exempted developing countries from its emissions obligations. And now we see that Brazil, that worker's paradise always held up to the United States as some kind of great "progressive" example, has been (shudder) drilling for oil! No one bats an eye or even says anything about it until seven months later! That activity ( drilling ... Shhh!) has been all but banned in the United States! If you need a reason to doubt the sincerity of the left when it claims that its efforts to throttle American economic might are motivated by a desire for such things as "clean air", add this to the pile. And then try looking at the pile! Dave Harriman's well-regarded "Physics by Induction" course is being made available to the public. [Harriman's] unique approach is to teach physics historically, thereby teaching it inductively. From the early Greeks to Copernicus to Newton, this course presents the essential principles of physics in logical sequence, placing each in the context of the earlier discoveries that made it possible and explaining how each was discovered by reasoning from observations. 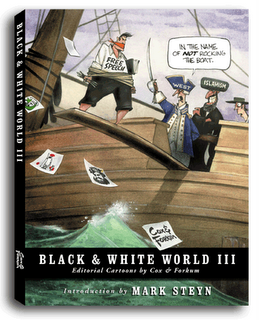 Cox and Forkum have just announced the availabilty of their latest book, Black and White World III! I seem to have found a new whipping boy in Arnold Kling, a "former" member of the far left who has "converted" to Libertarianism and frequently posts articles to TCS Daily. In his latest affront to the cause of individual rights, he discusses which form of government intervention would be best to combat the unsubstantiated threat of anthropogenic global warming. Quick! What's missing from the two excerpted paragraphs? For this essay, I want to take as given the report's assessment of the cost of global warming. Also, I will take as given that the strategy of reducing emissions of carbon dioxide, which I call the de-industrialization strategy, would cost one percent of global GDP each year. I want to suggest exploring an alternative strategy for fighting global warming, which I call the climate engineering strategy. I also will concede that I am not entirely comfortable putting the world's climate in the hands of scientists who attempt to engage in climate engineering. However, that discomfort is nothing compared with my fear of putting our future in the hands of international bureaucrats who are eager to embrace de-industrialization and to engineer a reduction of world GDP of $400 billion a year. Our Libertarian fails to mention that he also "takes as given" that we should simply forfeit our freedom and property to busybodies -- who would tax us at best and forbid us to enjoy industrial society at worst -- all because of an overhyped, undersubstantiated climate phenomenon! 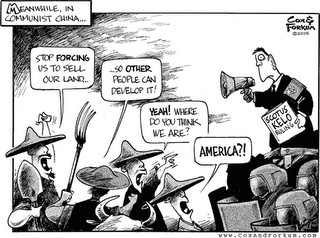 Even if industrialization did cause global warming, such solutions are wrong because they threaten individual rights. Mr. Kling, your "discomfort" is nothing compared to mine when I consider that you, who so quickly forget the importance of freedom, are regarded as one of its defenders! Why not talk instead about freeing ourselves entirely from governments that will take any excuse they can get to push us around? Back in World War II, we had a foe in Japan whose soldiers and citizens were so fanatical that they held military glory as a higher value than their own lives. Our leaders wisely decided to bring the war to them, ultimately showing them through the power of atomic weaponry what this really meant. They learned and we won. Today, we have a foe in Islamic totalitarianism whose soldiers are so fanatical that they didn't even wait for things to get desperate before they became suicide bombers. Our leaders have done little to bring the war home to them. In fact, our enemy is far closer to bringing home to us the lesson of complaisence than we are to showing them what war really means. I live in a country where alcohol is officially banned, but where the art of homemade spirits has reached new heights. Sharing my astonishment about the cocktail book with some friends with better connections to the Islamist regime, they explained the government has a silent pact with the educated and affluent in Iran's big cities, who render politics unto Caesar, provided that Caesar keeps his nose out of their liquor cabinets. In other words, the well-to-do Iranian drinks and reads and watches what he wishes. He does as he pleases behind the walls of his private mansions and villas. In return for his private comforts, the affluent Iranian is happy to sacrifice freedom of speech, most of his civil rights, and his freedom of association. The upper-middle class has been bought off by this pact, which makes a virtue of hypocrisy. The subtitle of the article sums it up best: "How can you have a revolution when everyone is watching TV?" Until we give them a reason to get up out of their couches and work for regime change, they probably won't.